Music Whenever; Black Moth Super Rainbow "Sun Lips"
A reader response to my first post about a hiking singlehander for a very big guy pointed out my lack of knowledge in regards to the Phantom dinghy, which, at second look, is an eminently sensible choice for a big guys singlehander. The Phantom can be home built, in fact was originally designed to be homebuilt. Plans are available though a quick search doesn't turn up an address to get them (strangely, even the class website doesn't seem to have an address). 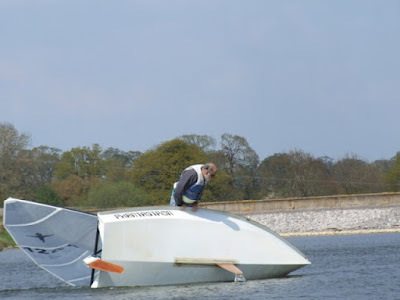 "I am also 6ft5 and over 18 stone and have absolutely no problems sailing a home built wooden Phantom which I took to runner up position in the UK Nationals. As I recall there are a couple of Phants being built in the US from plans provided by the Designer's daughter"
Longer at 4.42 meters, wider at 1.64 meters, the same hull weight as a Laser, and over 105 sq. feet (9.75 meters) of sail area, the Phantom must be a very lively sail. Class website is linked here . Joe over at the blog "Horses Mouth" did a fantastic post on the Phantom which can be viewed over here . A good video of a Phantom sailor blasting back and forth, forth and back, hitting over 14 knots - great fun. "I got in contact with Bill about the Classic Moth he built based on your station molds. I too am looking to build my own sailing boat, with looking to start on a smaller project first (~200 hours), and fell in love with the Classic Moth design, especially the curved tanks in the cockpit. I'm 6'5" and around 260 pounds (118 kg) so not sure if the boat would sail ok with me in it! Do you have any suggestions on an appropriate design and where I may be able to get the plans from?" "Your size will make it hard to make it work in a Classic Moth. You need a design with some displacement and nothing like some extra length to give you that. There's no stock design in a 14 to 15' length, easy to build, that immediately comes to mind. 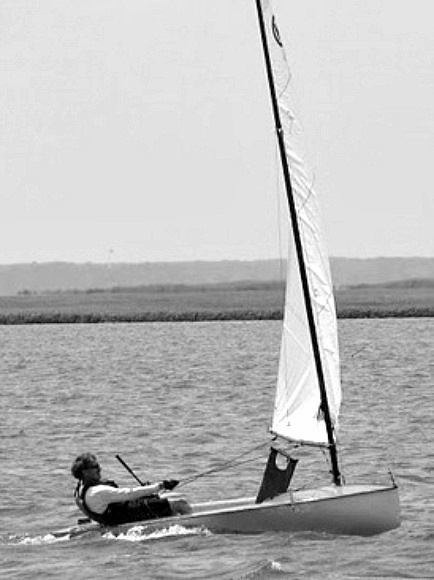 One of Chesapeake's Light Craft's multi-use sailboats/rowing dinghies might do the trick. I probably could draw something up that would fit, but boat design is a hobby and I have no time for it right now. I would think that something like the US1 sailboat class (no longer built) that was a singlehander based on the Windmill hull would fit you nicely." 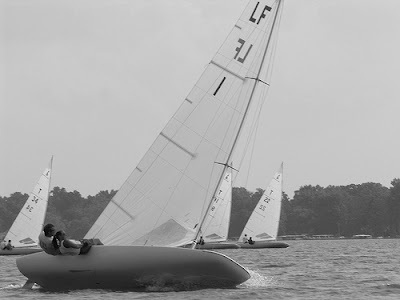 An interesting design problem as "C" is looking for a racy singlehander, easy to build and a design that would float a guy the supersize of an American football player. 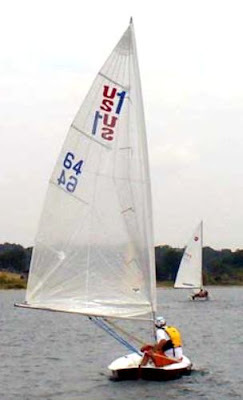 There are singlehander classes that have been designed for the larger sailor; the Finn Olympic dinghy, Bruce Farr's MegaByte, and from England, the Phantom dinghy and the SuperNova. But all these classes are production glass hulls and still not big enough to fit Mr. "C". 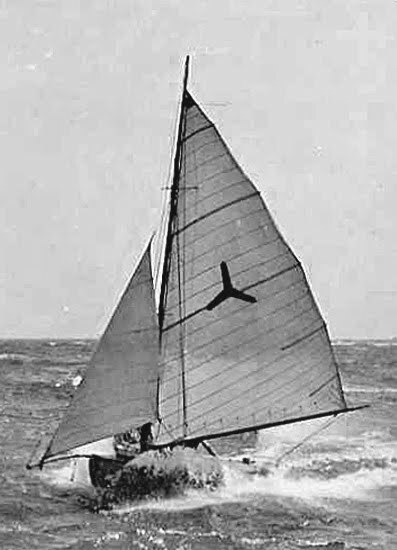 The US1 mentioned in my reply was an American class, built by Advance Sailboats. The Internet says 450 were built out of fiberglass and a quick Google shows one or two for sale even as I write this post. Advance took the simple V-chine, easy to build Windmill hull, cut some freeboard off the hull, added some rolled tanks and a large (90 sq. ft) main. Since the Windmill was sized to carry two adults (at say 300 lbs combined), it would be safe to say that the US1 could probably handle one at 260 lbs. And, since the Windmill class was designed for homebuilding in ply, an enterprising boat builder could replicate the US1 concept in plywood. The US1 class is no longer active. The best webpage on the US1 that I came across was an ad selling a US1 ...even had a movie. What the US1 doesn't completely solve for a big guy is lateral stability. 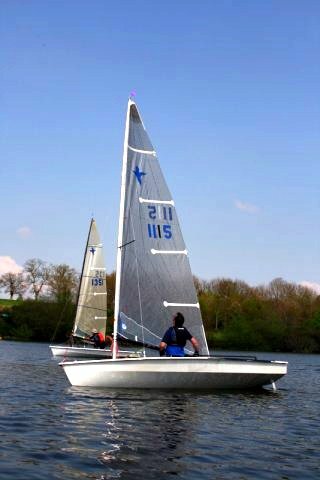 When you weigh 260 lbs (118kg) small dinghies have a tendency to lean radically into the skipper, particularly when the wind eases up. A big scow, say the MC scow, with less of a tendency to roll around might be a more pleasant sail for Mr. "C". In Internet browsing for this post, I also discovered a California builder who is supplying part build Windmill hulls . Music Whenever; U2 "Angel of Harlem"
Performed at Slane Castle, Ireland. Been catching snippets of the Tour de France and I always comes away shaking my head in awe at the athleticism and grittiness of the world's top bicyclists (I'd rank the Volvo Round the World and the Vendee Globe sailing races as, in the own way, just as grueling a sporting competition). Archipelago Raid, Day3&4 from Pure Archipelago on Vimeo. I have to reiterate what I said in my previous post on the Swedish Archipelago; a five day, multi-stop cat race would be a top notch Olympic event. The first photo is a Classic International 14 sailing, an Uffa Fox design, probably 1950's. 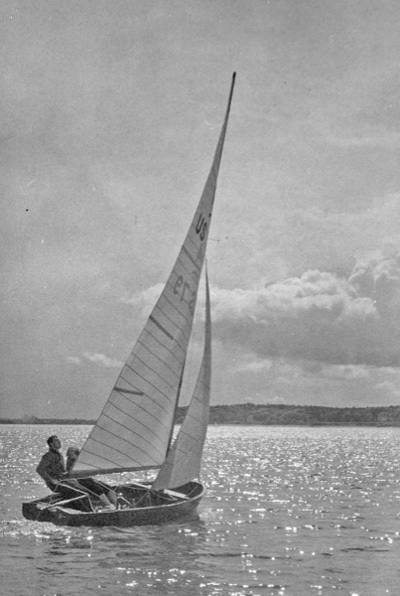 Second one is an Australian dinghy in big breeze; guessing 1940's or 1950's. I would think she's a skiff type, either a 14 or 16 footer but the bow doesn't look plumb like a skiff should have. The name TRIAD is attached to the file. For the first Music Index, click here. This is mostly for my benefit. Here is the index of the next 59 "Music Whenever" selections starting where the first Music Index (cataloging the first 59 music videos on Earwigoagin) stopped. Music Whenever: Bon Iver "Skinny Love"
Bon Iver - Skinny Love - Une Soiree de Poche from La Blogotheque on Vimeo. 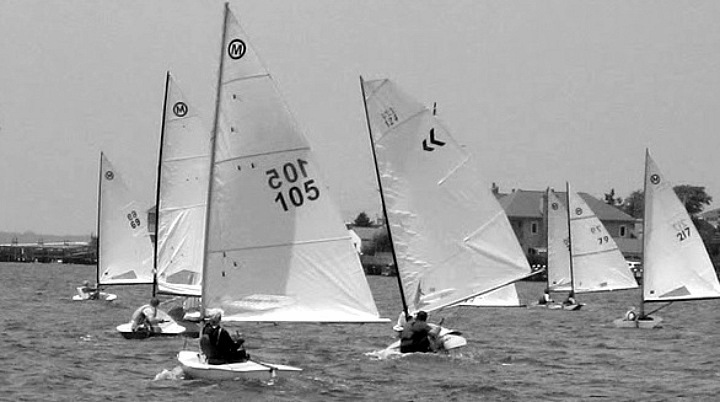 This blog is anything but topical, so I write this report about a month after I raced my Classic Moth at Brigantine New Jersey, only my second regatta of the year. We had good breeze this year, seabreeze direction, around ten with some gusts higher on some races. My mongrelized Maser was lacking some speed in the Gen1 division when matched against the two thoroughbred Olympic Europes sailed by Walt Collins and George Albaugh. I didn't help matters much with two premature starts in the last two races, though this is typical for me when I haven't been racing much. For some strange reason, the Europe Dinghies seem to have picked up speed when using regular Classic Moth sails instead of the cut down Europe Dinghy sails. For the overall trophy, John Z eked out Joe Bousquet at the finish of the last race after a stirring tacking duel up the last beat. For more complete reports, link over to George's blog or over to Joe's blog . Two pics from the regatta that I lifted from George Albaugh (I think taken by his daughter Ingrid). Agan, many thanks to Joe and Judy Courter for the always superb prerace shindig at their waterfront home. Music Whenever: Loose Marbles, Meshiya Lake, "When I Get Low, I Get High"
My "Zen of Daysailing" series of posts is just that; no racing, just video clips of people out for the enjoyment of a daysail. My previous posts in the Zen series can be viewed here . Snipe sailing..... looks like Florida to me. Untitled from Kelly Rae Ardis on Vimeo. Before someone else points it out; the music by Wiz Khalifa, with it's unabashed hedonism and drug consumerism (I hear the word misogynistic tossed around all the time when these type of lyrics are discussed), is as far as you can get from Zen. Also, the lifestyle is very foreign to an old married fart like me but the music does have a good toetapping rhythm. Laser forums have been abuzz recently about the "new Laser sail design", one that will be much more durable than the current model. In a exclusive to Earwigoagin, we have obtained secret footage of the new Laser sail undergoing on-the-water tests. Sorry, I can't divulge the location, the skipper, or who was filming this. Junk Rigged Laser from Ryan Barber on Vimeo. Despite this blog being mostly about dinghy sailing (and weird music videos), I normally sprinkle keelboat posts here and there just to maintain some diversity. Back in 2007, Russell Coutts developed a mini IACC type keelboat class called the RC44 (RC=Russell Coutts..... makes sense). I guess the original idea of this class was to be the stepping stone, the triple AAA league if you will (American baseball terminology) for pro sailors progressing to the larger America's Cup arena. Well, the switch to multihulls squelched that idea but, from the following video, it looks like the class is doing just fine in Europe. I like the action in this video of RC44 racing. Not an over produced promo film, this short features simple editing of onboard camera footage as we race around the course in a fleet race. Music Whenever: Black Crowes "The Night They Drove Old Dixie Down"
This past April marked the beginning of the sesquicentennial (150 years) of the American Civil War. The Black Crowes do a superb cover on The Band's mournful ballad about the end of the Rebel South. I'm always on the lookout for boats going down the highway.... sort of like bird watchers or those who sit by airports watching the planes landing and taking off; its a secret test to see if I can correctly ID that boat that is quickly disappearing in my rear view mirror. I was floored about two weeks ago with an extremely rare sighting. I was bombing westbound over the Rt. 50 Severn River Bridge about 4:30 pm. The eastbound lanes were slowed to a crawl as they came up on the bridge, as is typical at that time of day. And then I saw a strange boat being cartopped on what looked to be a Volvo station wagon. In that one or two seconds I had available to glance over....bingo.....paydirt! For I knew immediately that there were probably only 20 or so people in the U.S who had a chance at ID'ing this craft and I was one of them. The sliding seat strapped next to the hull gave it away. It was an International Canoe, but not just any International Canoe, the low chine indicated the latest generation International Canoe and not the old Nethercott hull. The long mean bow with the rig set aft looked like the latest Chris Maas design, probably the fastest IC going at this time. Well, the Maas International Canoe is known to primarily reside on the West Coast; it was indeed a rare event to see one on the East Coast. I needed a confirmation since it's been close to eighteen years since I was active in the class. I called up good friend Bill Beaver and, "Yessiree Bob", I mean Bill, who said it must have been Chris Maas driving up to Rhode Island to catch a container to Germany for this year's World Championship. 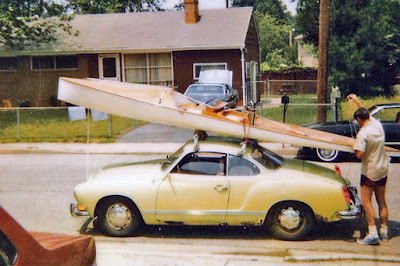 Well, this sighting of a cartopped International Canoe brought back memories of an eccentric fellow from Annapolis who cartopped an International Canoe on a rusty Karmann Ghia during the 1980's. Never too far mind you, maybe 30 miles max. Believe it or not, the IC never fell off. All my International Canoe Posts can be seen here .